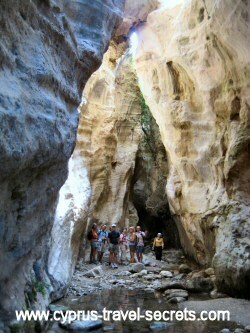 Do some spectacular gorge walking near Paphos in the famous Avakas gorge on the Akamas peninsula. Take a walking tour through the gorge with experienced guides who know the best time to tackle this spectacular trek. The Avakas gorge walk is a mixture of scrambling and walking so requires a reasonable level of fitness and a willingness to get wet - even in summer there are pools of water in the gorge which makes the stones and boulders slippery so wet feet are a definite possibility! The entire route is just under 11km including walking back to the start point via the dirt road that runs above and to the side of the gorge. It is of course an option to do the walk up and back the same way but it can be tricky negotiating slippery boulders DOWNHILL so a circular walk is preferable for safety reasons. Start the walk at the entrance to the gorge (accessible from Ayios Georgios close to Coral bay - simply take the bumpy off-road track onto the Akamas and follow it until you see signs to the gorge entrance) and make your way up the track that leads to the first boulders. Tip: Not sure about how to tackle the Avakas gorge walk whether it's lack of transport or maybe a fear of doing the trek on your own? I can arrange a tour through the gorge with experienced guides (including ME!) who know the area intimately and can guide you safely on your gorge walking adventure. Just contact me for further details. The most spectacular part of the walk is early on where the sides of the gorge virtually touch and there is an eerie yet beautiful light - the best spot for picture taking (see the picture opposite ). Many people just walk to this point but for the intrepid, you can carry on up the gorge picking your way across pools of water and clambering over boulders of varying heights. Towards the top of the gorge you will come across the wreck of a lorry and wonder how on earth it got down there. When the gorge opens out onto fields usually filled with goats, there is no obvious track - you just need to head RIGHT upwards across the fields until you reach a wide dirt road then turn RIGHT again and follow it all the way back down to the start point. Tip 1: An alternative but much longer route back is to head LEFT at the top of the gorge and turn LEFT onto the white track above the gorge and then down onto the beach track that eventually leads to Lara bay. Once on the coast track you then head back LEFT to the car park but it's a good 50 minutes walk along the coast track and will add 1.5 hours to the walk. Tip 2: Do NOT attempt the Avakas gorge walk in the winter months (January/February especially) after heavy rainfall or unless you have a good weather forecast for the day - there is a high risk of rockfall in bad weather plus there could be a literal torrent of water in the valley streams cascading down the mountains from above.